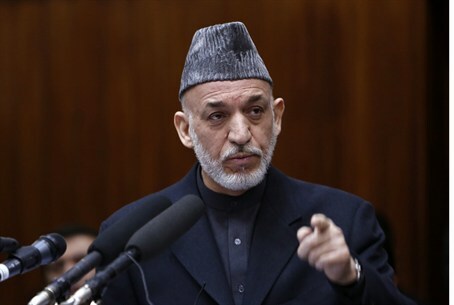 President Karzai has accused the US of colluding with the Taliban to justify its presence in Afghanistan. President Hamid Karzai has accused the United States of colluding with the Taliban to justify its presence in Afghanistan, dumbfounding US officials during a problematic visit by the new Pentagon chief. A joint news conference by Karzai and US Defense Secretary Chuck Hagel was cancelled Sunday, as the Afghan leader's allegations compounded the troubled nature of the visit after a security scare from twin bomb attacks on Saturday, AFP reported. "The bombs that were detonated in Kabul and Khost were not a show of force, they were serving America," Karzai said in a televised speech, referring to the two suicide blasts in which 19 people were killed. The president said the United States was in "daily" talks with the Taliban in Europe and Gulf countries, and that insurgent suicide attacks enabled the international military force to vindicate its deployment in Afghanistan. "It is their slogan for 2014, scaring us that if the US is not here our people will be eliminated," he said, as US-led combat troops begin a long withdrawal after more than a decade of war. Karzai, who has frequently lashed out at perceived US slights, was angered by a new delay to the planned transfer of the controversial Bagram jail from US to Afghan control. He is also adamant that his government must be involved in any US-Taliban contacts, although the Islamist militia dismisses him as a US puppet and says no dialogue has taken place with the Americans since a year ago. Waheed Wafa, director of the Afghanistan research centre at Kabul University, said Karzai's remarks were not an irrational outburst, but a message calibrated for a domestic audience. "Using this language Karzai is trying to convince the Taliban into peace talks under his administration and keep the US away," Wafa told AFP. "Karzai's fear is that he will be sidelined from the process. This hurts Karzai and provokes him into saying things like yesterday and making decisions such as removing US special forces from Wardak and imposing a deadline for the Bagram handover." Karzai has accused US special forces in the strategically important Wardak province of fueling instability and had set a deadline for their departure that expired Sunday. The president's news conference with Hagel was scrapped just a few hours before it was due to be held at the presidential palace in Kabul, with US officials citing unspecified security concerns. General Joseph Dunford, commander of the 100,000 NATO forces in Afghanistan, said Karzai's allegations were "categorically false". "We have no reason to be colluding with the Taliban, we have no reason to be supporting instability in Afghanistan," he said. "We've fought too hard over the 12 years, we have shed too much blood over the past 12 years, we have done too much to help the Afghan security forces grow over the last 12 years to ever think that violence and instability would be to our advantage." The Pentagon chief, on his first official visit to Afghanistan after he endured a difficult confirmation process by the US Senate, tried to downplay tensions with Karzai after they met in private. "He has his ways," Hagel said. "There will be new challenges, there will be new issues. It shouldn't come as a surprise... but I don't think any of these are challenges that we can't work (our) way through." Both Hagel and Dunford denied that the US-Afghan relationship was broken, and a senior US official said on condition of anonymity that Washington still felt it could have a "productive relationship" with Karzai and the Afghan government. But the official added: "We have indicated to him in private that public criticism is not helpful to the partnership, especially when there's no basis in fact for some of the claims he makes." The testy exchanges came as the two countries face up to an arduous transition phase in which NATO-led troops exit Afghanistan and Afghan forces take on fighting the Taliban alone. The United States and Afghanistan are also negotiating a strategic pact that will determine the US presence in Afghanistan after the end of the international combat mission. Also troubling US-Afghan ties has been the long dispute over the fate of suspected militants held by US forces at Bagram jail. A final handover scheduled on Saturday was delayed due to last-minute disagreements, officials from both sides said.